To most people, this is a fairly non-descript stuffed animal. H & M has probably sold thousands of these penguins at $4.99 a piece this year, and I bet a lot of them end up in baskets of other stuffed animals children have accumulated over time. To K, however, this little guy is the most special stuffy in the world. His name is Pengui, and he is K’s constant companion. Their relationship is a curious thing. The boys first saw the penguins during a visit to Hamilton last summer. They decided not to use their allowance to buy one at the time, but somehow the memory of that little penguin stuck with them. When we returned to the same H & M after Christmas, the boys made a bee-line for the children’s section and were ecstatic to see that a few of the little guys were still left. A called his Snowie, and K called his Pengui. 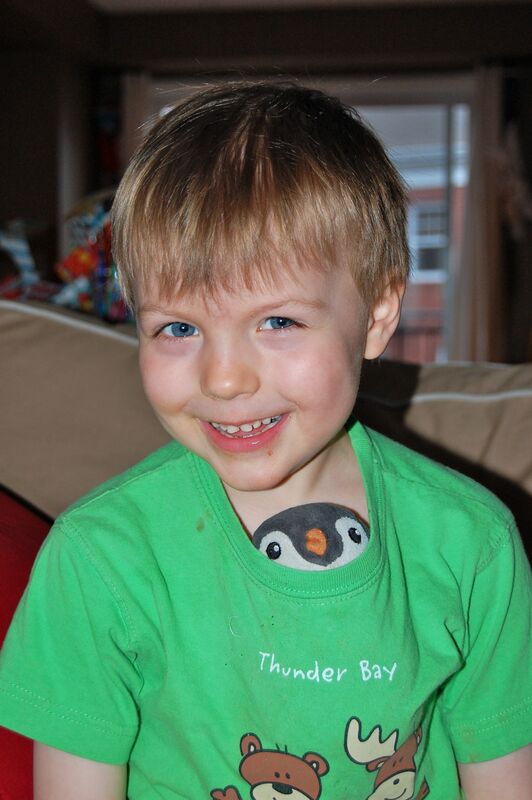 Over the past five months, Pengui has become the most important figure in K’s life (present company excluded). He goes everywhere with him, usually stuffed down the front of his shirt or poking out of the arm of his coat. Pengui is on a first-name basis with all of the teachers, care-givers, parents, and kids at school – I think he’s actually become a minor celebrity in the kindergarten world. K gets really upset when Pengui isn’t around. A few weeks ago, K went to get Pengui before school and we couldn’t find him. With K practically in hysterics, I explained that he was probably hiding behind the bed, or resting in the laundry hamper, and we’d find him that evening after school. When we got home, we did a systematic room-by-room search of the house. After 20 minutes, I was convinced that Pengui was not in the house after all, and a feeling of dread came over me. We got in the car and began to retrace our steps from the day before. A volunteered to search the karate studio, which turned up nothing. We continued on to Swiss Chalet, where we had picked up dinner the night before. K and I asked the woman at the front counter if she had seen a little penguin, and K literally jumped for joy when she said he’d been sitting on the counter all day and all night. I told K he was lucky to get Pengui back, but K thought Pengui was the lucky one because he got to stay all night in a restaurant and eat pepperoni pizzas. Penguins have now become a common sight in our home. 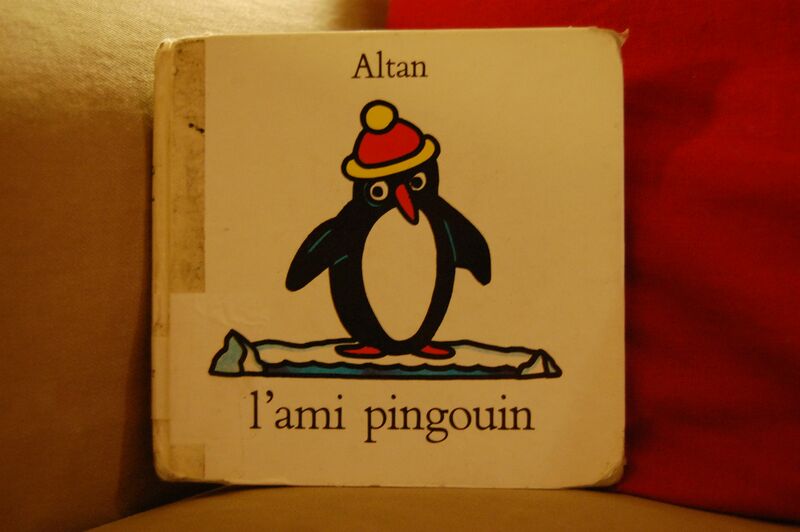 K often brings home artwork depicting the adventures of Pengui, and teachers seem to be directing him to books that contain even a hint of penguin-related content. 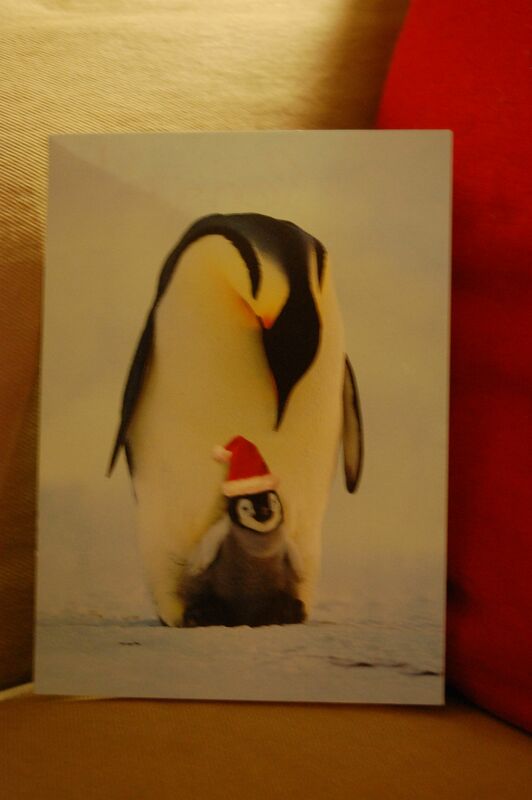 K’s belated Christmas card to Pengui. I’m not sure how long this obsession will last, but it’s undeniably cute. The affection K has for this little stuffed toy is genuine, and he keeps us entertained with stories of Pengui’s adventures. I’ll be sad when he outgrows it, just like he and A have with other favourite toys and furry friends over the past few years. 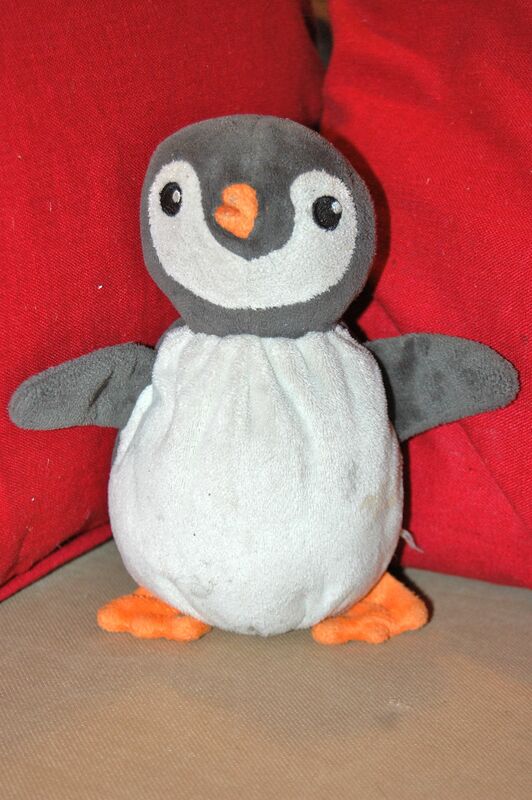 I hope Pengui will be around for a while, and when the time comes, I’ll bundle him up with the jingle-eared teddy bear that I’ve kept around for the past 35 years and wait for the grandchildren to arrive. What a great post. 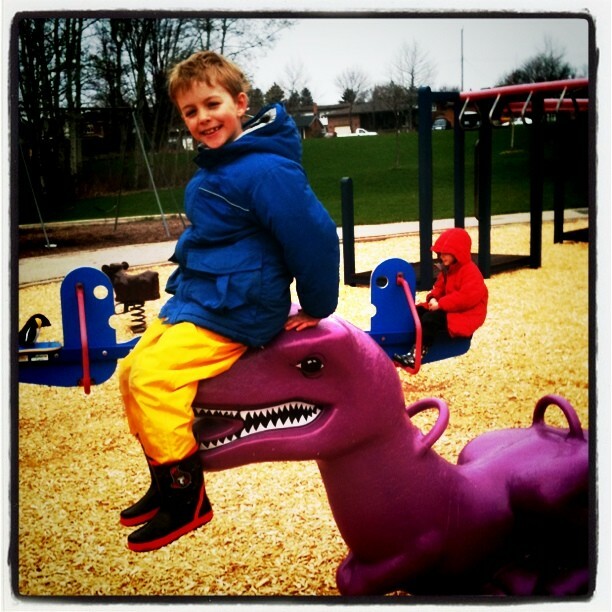 I love the photos, esp the teeter-totter. May K and Pengui share many fond memories together!